In an announcement earlier this month, Boris Johnson launched a £4 million bid to exploit a golden triangle of life science linking London, Oxford and Cambridge. The London Mayor wants to build a ‘MedCity’ to rival the likes of Boston, Massachusetts, in America. From a property point of view, the cathedral cities of Cambridge, Oxford and Winchester already form a golden triangle of alternative learned and cultural hubs with easy access to the capital, but there is a new pretender to the throne in Canterbury. Prices for properties in and around Canterbury are considerably cheaper than their counterparts in other prime cathedral cities-some agents say they can be as much as 50% cheaper than in Winchester. ‘There’s certainly a big difference,’ agrees Mr Jordan. ‘The Regency terraces of St Dunstan’s have always been one of the most desirable places to live because of their proximity to the city centre, but that’s even more true now as it’s also the right side of the city for the station.’ He quotes prices for a four-bedroom family house as starting at about £650,000, but warns they are in short supply. 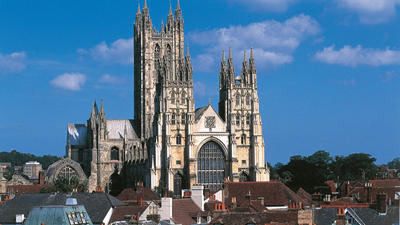 Like other cities on the Golden Triangle, Canterbury has its fair share of good private and State schools including King’s School, St Edmund’s and Simon Langton Grammar. These all prove a magnet for parents looking for an alternative base to London, but they’re also putting Canterbury on the international map: in the past 12 months, Chesterton Humberts have sold three properties to Chinese buyers as well as a smattering of the French and other Europeans. Indeed, this is another feather in Canterbury’s cap: it takes almost the same amount of time to get to France as it does to London. ‘You can drive to Folkestone in about 40 minutes and then hop on Le Shuttle and be in Calais in time for a morning coffee,’ says Mr Church. This proximity has encouraged a number of French and Belgian buyers across the Channel. ‘But they tend to buy country houses in the surrounding villages, rather than in the city,’ he adds. Mr Jordan recommends country house buyers look in villages such as Bridge, Bishopsbourne, Barham and Elham or, on the other side, Wingham, Littlebourne and Wickhambreaux. And, although Canterbury will never compete in terms of size and heritage, it does have one final lifestyle advantage over its competitor cathedral cities: access to the sea as the fishing village of Whitstable lies only six miles north of the city. Once just known for its oyster festival, it now hosts a biennale, has its fair share of smart restaurants and good pubs and is a fashionable hangout in the summer, which, depending on what you’re reading, has been re-christened as either Notting-Hill-on- Sea or Dalston-on-Sea.